Same face, exactly the same base makeup; this was taken about ten seconds before I put the lipstick on. The bright orangey-red is quite a game-changer, isn’t it? If ever something was going to completely transform your look… There’s no eye makeup here at all, here, not even a lick of mascara. 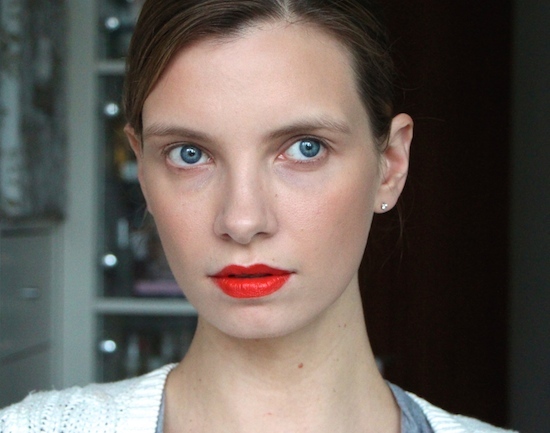 The bright lips just turn everything upside down, beauty-wise – it’s a real shock-to-the-proverbial-system. Illamasqua’s Soaked is a bright, bright reddish-orange; no doubt you’ll have seen a fair few shades like this about. (MAC’s Morange comes to mind instantly.) 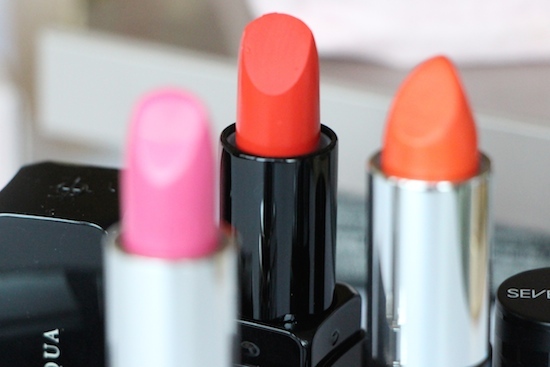 This kind of red/orange (or orange/red) is probably the most popular “statement” shade so far as lipsticks go, and for good reason; it really does give your whole face a bit of a lift. If you need to look as though you’ve made an effort but can’t be bothered to faff around with creating a smokey eye or a winged eyeliner, then a bright, punchy lipstick like this one is a brilliant quick fix. It’s no trouble at all to keep a bright lipstick in your handbag (or desk, or car glove-box), but it can make all the difference between looking “casual-not-made-an-effort” and “casual-but-I-meant-to-be-and-I’m-incredibly-stylish-don’t-you-know”. Soaked has a “velvet” finish – “velvet” being the new buzz-word/marketing-spiel for “it’s matte, but not drying”. This one certainly isn’t drying, not at all, but don’t make the mistake of thinking that it’ll give you vast amounts of sumptuous moisture throughout the day. It’s a colour-punch (can you tell I’m writing this after a few red wines?) but it’s not a plumptious one. And neither, so far as I can tell, is it supposed to be; this is a modern, cool, arid colour. It’s not for the faint-hearted, but, in a way, it’s actually quite suited to the faint hearted: remove the hi-shine finish from an in-your-face shade like a hot pink or a neon orange and you suddenly have something that’s infinitely less try-hard, miles less “look at me!”, far more fashionable. I’d almost say (but don’t quote me on this, as I have had some wine and am feeling reckless) that matte shades are easier to wear than glossy ones. 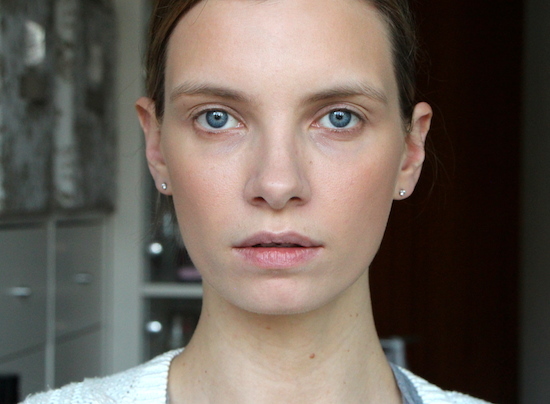 Yes, matte formulas tend to show up flaky lip imperfections more readily; but once you get past that little hurdle (bit of lip balm buffed in with an old toothbrush the night before, slick of NUXE Reve de Miel patted on a few minutes ahead of the lippie), once you get the skin prepped a bit, a matte effect is actually far easier to maintain than a high-gloss finish. I digress; this was supposed to be a short little post to bring your attention to a nice summer lipstick – I’ll delve more deeply into the pros and cons of the matte lip another time. Tell me though; on which side of the lipstick fence do you sit? Glossy, matte or somewhere in-between? Call this research for my upcoming “matte lip” feature.